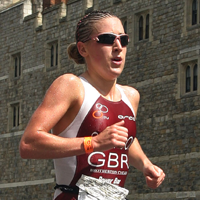 Triathlete Jodie Stimspon kept a training diary in the run up to the Nokia Windsor Triathlon, where she took gold and smashed the course record in the process. 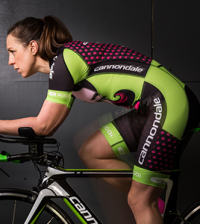 Throughout this week she shares it with Sportsister – read on for day six and race day. The day before the Nokia Windsor Triathlon and I woke up about 6.30am and I was straight up and out the door for a little run before I travelled down to Windsor. It’s about a 2hour drive to Windsor and I drove down with another triathlete Zoe, arriving about 2.00pm. We went straight to the race venue to register and rack the bikes and when I arrived I was pleased to see Stuart Hayes, who was also racing tomorrow, in the transition area. The sun was shinning – we always seem to be lucky at the Windsor triathlon. The past two years I’ve done this race it has been a beautiful day and it was looking like doing the same again. After registration was sorted and I had collected my race pack it was to the hotel to get tea and an early night. Nokia Windsor Triathlon Race Day! Race day was here and I was up at 6.00am and in breakfast for 6.15am. My race day breakfast is always the same; porridge with a little sugar and two pieces of white toast with butter and jam and of course a coffee. After breakfast we drove to the race and got there about 7.45am, even though the race didn’t start until 9.30am I like to be there well in advance to be prepared and not rushed. So I got my transition area sorted – bike in with shoes and gels attached, with helmet sitting upside down on my tri bars ready for a quick exit and my running shoes awaiting by the side of my bike. Then I went down to the swim start and dropped my race bag off to dad to watch for me whilst I went for a warm up run. I then headed back to see dad and my support crew which consists of dad, mum, sister and brother in law who follow me everywhere and I love their support at my races! Michelle Dillon (coach) was waiting for me for my race prep talk, Mish is great and really gets me fired up for the race! It got to about 9.15am and I was in the water warming up, doing a few sprints and getting ready to race. Then it was 9.30am and we had the ref saying, “We will not start until you are all behind me.” This happens every race, no one wants to go too far back in case the ref say “Go!” and you’re behind the other girls and end up in a washing machine start. The race started and I got a good start. I was straight over to the right hand side of the river bank as I learnt last year, the further you get over to the river bank, the greater the advantage is, so I was basically swimming in the weeds. 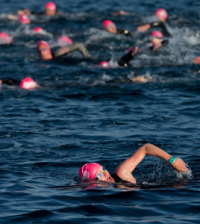 As the swim progressed I was in the perfect position behind the leader, Rebecca Milne’s feet, and I stayed there for the 1500m swim and entered transition along side Rebecca Milnes and Non Stanford. On the bike I just put my head down and got into my time trial mode which is where me and Rebecca Milnes got away. We worked together for the 40km of the bike and got a huge gap of over five minutes on the chasing pack. Rebecca and I worked really hard on the bike together and it paid off. I just went for it as soon as my running trainers were on. This is were being part of team Dillon has really paid off for me this year and I’ve started to feel like a runner. Having Michelle as a coach has really brought this part of my race on and I just powered through the run. I felt stronger and stronger and crossed the line with over seven minuets on 2nd place Jill Parker. I was on top of the moon winning Blenheim the weekend before but winning the Nokia Windsor Triathlon felt even better, not only because the race is so popular but the victory was even sweeter by beating the course record which was held by the 2008 World Champion Helen Jenkins! 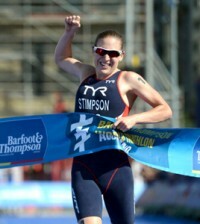 Windsor is a challenging, fantastic race and I can’t wait till next year to race there again. Race breakfast: Porridge with sugar and white toast x2 with jam and butter. Straight after race: Powerbar Protein shake and High Protein Powerbar.